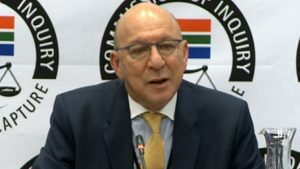 Former minister of Finance Trevor Manuel has expressed concern over the state of affairs at Eskom. He says part of the reason why State Owned Enterprises, like Eskom continue to be in a state of collapse is because the Public Finance Management Act is not followed. Manuel is testifying at the Commission of Inquiry into state capture in Parktown, Johannesburg. He says Eskom used to be the center of investment, but that has changed in the past 10 years. He says Eskom’s financial situation increases the burden of debt of the general economy. He says this leads to the country having to borrow money at a much higher cost. Manuel has also described how ministers were selected by former presidents Nelson Mandela and Thabo Mbeki. He says ministers were appointed to former president Jacob Zuma’s cabinet by external people. The post Manuel expresses concern over Eskom state appeared first on SABC News – Breaking news, special reports, world, business, sport coverage of all South African current events. Africa's news leader..